DUKE 70, Depaul (Blue Demons, 15,944 students, Chicago, IL) 63 – Karima Christmas had 23 points and nine rebounds, Jasmine Thomas scored 19 points and Duke beat DePaul on Sunday to reach the regional final for the second straight year. The Blue Devils (32-3) will play top-seeded Connecticut on Tuesday night with the Final Four at stake. 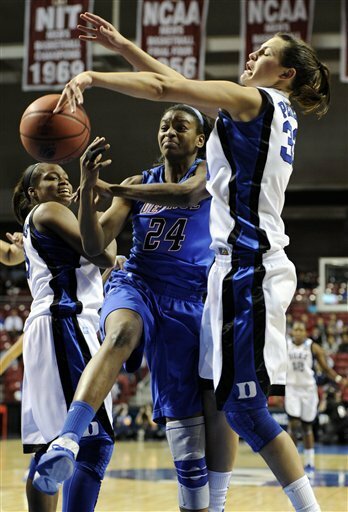 The Huskies thumped Duke 81-57 on Jan. 31. Chelsea Gray scored 16 points for the Blue Devils, who raced to a 15-point lead and had to hold on after the big advantage nearly evaporated late in the second half. DePaul’s Deirde Naughton hit two 3-pointers in less than a minute that cut the lead to three each time. The Blue Devils wrapped it up at the free-throw line. Naughton scored 17 points for DePaul (29-7). The Blue Demons have never played in a regional final. Duke lost to Baylor in its regional final last year. Stanford (Stupid Tree, 15,319 students,Stanford, CA) 72, NORTH CAROLINA 65 – Nnemkadi Ogwumike and her freshman sister, Chiney, scored 12 of Stanford's final 15 points and the top-seeded Cardinal held on in the final minute for a win over No. 5 seed North Carolina on Saturday night in the Spokane Regional semifinals. Nnemkadi Ogwumike led the Cardinal with 19 points while Chiney, the Pac-10 freshman of the year, added 16. Pohlen missed eight of her nine shots and finished with just six points. Italee Lucas led North Carolina (28-9) with 22 points and Tierra Ruffin-Pratt added 14 off the bench, but the Tar Heels were hampered by a tough night from forward Jessica Breland, the Tar Heels' second-leading scorer. Breland made just one of 13 shots, missed both of her free-throw attempts and finished with just two points, 10 below her season average. The result is what you'd expect with the Tar Heels and Cardinal involved--a tight matchup that came down to the final possessions. But it was the Ogwumikes making the plays when the Tar Heels went cold. Tied at 59 with 4:35 left, Nnemkadi scored consecutive baskets to push the Cardinal ahead by four. She scored with 3:08 remaining, then saw her sister come up with a big bucket in the lane with 1:59 left after North Carolina had pulled even at 65.
committed in its final five possessions and Pohlen knocked down three free throws in the final 30 seconds. Chay Shegog added 13 for North Carolina, who rallied from a seven-point deficit early in the second half but only once took the lead on Lucas' basket with 6:51 left. North Carolina went the final 3:42 without a field goal.